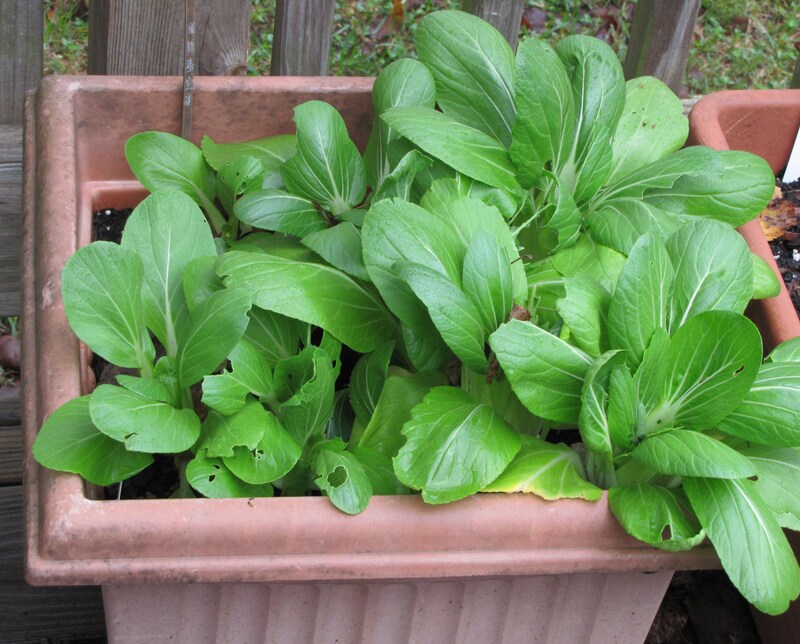 Last year, I planted pak choi (also known as bok choi or bok choy) in a large, plastic container on my deck. Pak choi is a type of a Chinese cabbage, a member of the brassica or cabbage family. I had never eaten pak choi before but I had a new seed packet of baby pak choi “Green Fortune” from Renee’s Garden, an online seed source for veggies, herbs, and flowers in California. Renee’s Garden has distinctive seed packages: the fronts have beautiful, colorful drawings while the backs have an extra flap of paper to provide more than enough information to start seeds successfully. Unlike the species which can grow to a foot, “Green Fortune” was bred to remain short, only six inches tall. Thus, it grew well in the container which was about a foot wide and tall. The stems were thick and white; the leaves were light green and as broad as a Chinese soup spoon. I harvested by cutting the outer leaves and was surprised to find that the stems were sweet enough to be eaten raw. The crunch texture was similar to celery. My family enjoyed the leaves and stems in our chicken stir fry dishes and I even tossed some pak choi into our crock pot stews. Because I successfully added a new vegetable to our family’s repertoire, I decided to plant more pak choi this spring but in the ground. In March, I planted three rows of seeds from the “Green Fortune” package (yes, the seeds were a year old by now) and “heirloom” seeds from Lake Valley Seed Company in Colorado which I must have gotten from a seed swap I attended in February (more on that in a future post!). The Lake Valley Seed package was packed for 2012 so between the two packages I did not expect much. I usually do not have much luck with broadcasting seed and right after I planted three rows, it rained so hard I thought for sure the seeds would be washed away. However, within a few days, the ground was littered with many green buttons, popping out of the ground. There were too many, too close together but the seedlings were too small to lift and separate – there was no “stem” for my fingers to grab. Fortunately, I facilitate a garden club at work and we meet every other week during lunch in a conference room. 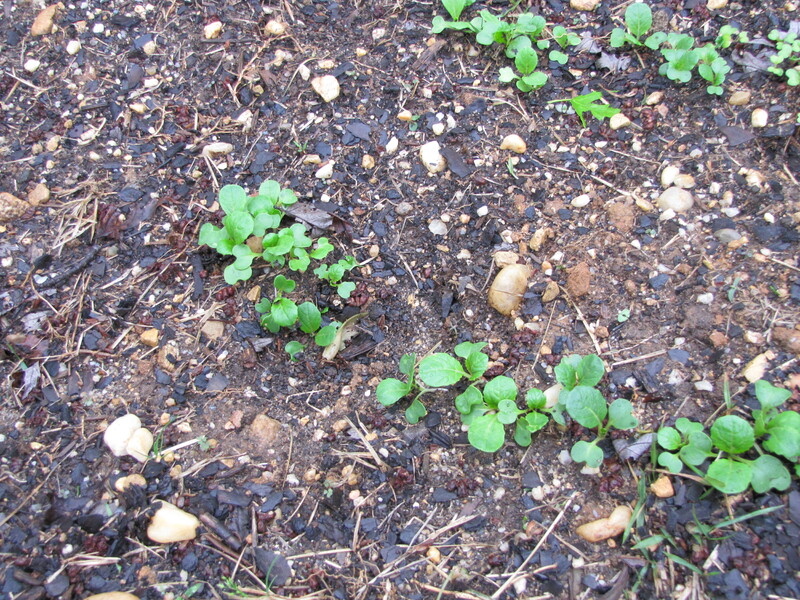 The morning of our next meeting, I took my trowel and scooped out a section of soil with seedlings on top and placed the chunk in a plastic strawberry container. I used the clear plastic containers that strawberries are sold in, about six inches long and three inches wide, perfect size for a wedge of soil. For each container I inserted a wedge of soil with seedlings on top, snapped the lid closed, and placed in a plastic bag (the containers had holes and I could ill afford to spill dirt in the conference room). I put six plastic bags in a large brown bag and distributed the bags to my colleagues. They really appreciated receiving pak choi seedlings where all they had to do was just plop the chunk of dirt in their own garden bed when they got home. Later, when the seedlings get larger, we will have to lift and separate each plant to allow more space but giving bags of instant pak choi was just as much fun for me as it was for them! This entry was posted in Uncategorized and tagged Green Fortune, pak choi, Renee's Garden. Bookmark the permalink.